I'm a Doctor Who fan - a Whovian, if you will. I got into the rebooted TV series thanks to fellow geeks and now I'm totally hooked. And with the main show done for this season (apart from the obligatory Christmas special), I'm finally starting on the classic series in order to round out my Doctor Who education. I picked up this book since it was on sale over on Amazon's Kindle Daily Deal page plus it featured a Dalek in the title and as the primary image on the various versions of the cover. However I admit that I had no idea who Nick Griffiths was before reading this book - and here I was diving into his memoir. But there's a thing among geeks with similar interests that sort of ties us all together. And reading this memoir felt a lot like that. It was almost as if I had bumped into him at some coffee shop and ended up getting into a rather lengthy conversation. And it's not the sort of conversation that you feel trapped in - it felt nicely genuine and certainly enjoyable. And that's what this book is like, in a nutshell. Synopsis: Dalek I Loved You is a memoir of sorts that was written by Nick Griffiths, a freelance writer who has contributed to many periodicals and magazines over the years including the Radio Times and many others. I read the Kindle edition of this book, which includes some bonus content in the form of poems about the Doctor and such. The book begins by explaining how Nick gets into Doctor Who at the tender age of four. And this sort of sets the tone for the rest of the book as we follow his progression as a Doctor Who fan starting from his childhood all the way to the present. And man, this guy really knows his stuff and I feel like I got an education in Classic Doctor Who stories. But this is not a Doctor Who fan book alone. After all, this book is positioned as a memoir. So what really fleshes out the book is the story of Nick's life - or at least key moments that are particularly memorable to him. And he marries the two concepts or narrative forms by writing about how Doctor Who has continually played a role in his life or at least he parallels his life events with Doctor Who events as well. Griffiths is quite the delightful writer. He is able to use humor to good effect even when talking about fairly serious events in the course of this narrative. And it's not humor that is all that hard to appreciate. Sure, it may be a little self-effacing, but that's more because of the fact that it's a memoir and he's a geek. Geeks like to pick on themselves all the time. But he is able to do this to great effect and ultimately moves the story forward. By the end of the book, you'll walk away with a better appreciation for the Classic Doctor Who - at least from the perspective of Nick Griffiths. And you may also decide to investigate some of the other movies and TV shows that he mentions in the book given how passionately he speaks about them. Case in point, I've just acquired a copy of Withnail & I out of sheer curiosity. And the icing on top is the fact that his son writes a chapter as well all the way towards the end. And I think that was the most endearing part of this book overall. Sure there were nice moments in the story and of course the weird poems at the end, but that chapter by his son Dylan is really tops. 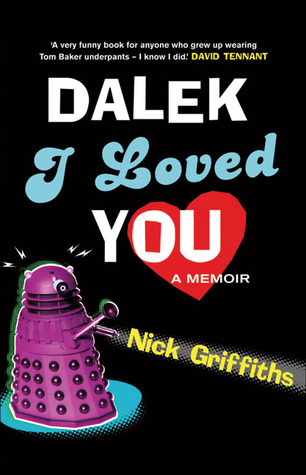 Dalek I Loved You is a great read for any Doctor Who fan in case you ever wanted to get into the mind of a fellow geek. But if you've never watched the show, then you still may very well enjoy it given how well it was written from a very human perspective. Thus I rate the book a good 4 bullet lists throughout the book out of a possible 5.